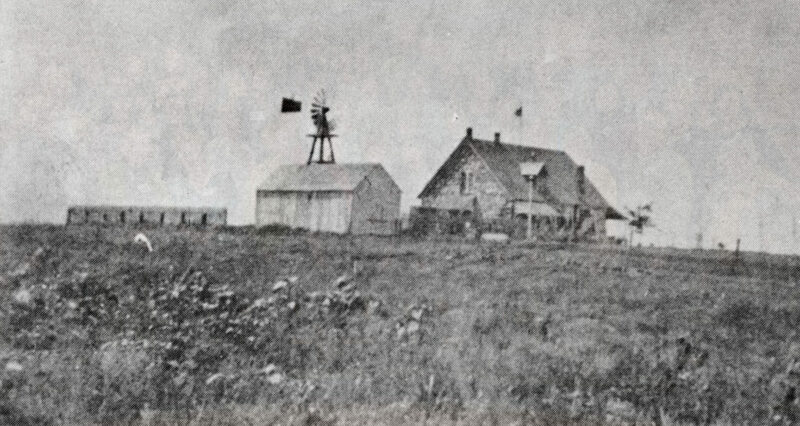 It is hard to believe the Highlands Ranch Mansion began as a small stone farmhouse on the isolated plains of early northern Douglas County. Built in 1891 by a Pennsylvania man named Samuel Allen Long, the original building measured about 30 feet by 50 feet and featured a traditional gabled roof, a one and one half story upstairs bedroom space, and a front porch with an overhang. Long called his home and surrounding farm “Rotherwood” after another farm he admired during his childhood. He carved this name in the stone above the front doorway of his home and the construction year “1891” just below an upstairs window. Visitors to the Mansion can find these two carvings by simply looking upward when entering the building through what is referred to today as the Rotherwood door. The Mansion’s foyer presents an impressive entrance to the prestigious estate. 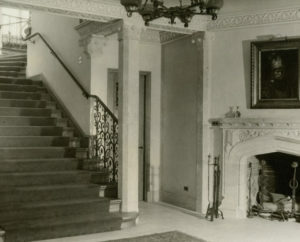 The room as it appears today was constructed during owner Frank Kistler’s 1929-1930 renovation of the building and included the addition of a grand staircase and equally grand carved wooden door. Prior to Kistler’s renovation, the stairway was located along the back wall of the first house, and connected the kitchen with the upstairs bedrooms. A window formerly occupied the space of Kistler’s exquisitely carved front door. Perhaps the most unique feature of the Foyer, however, is the turret located above it. A standard in European estate homes and castles for centuries, a turret served the dual purpose of being aesthetically dramatic and properly functional by providing a lookout point with 360 degree views of the countryside. When the Mansion’s second owner, John W. Springer, added the turret to Samuel Allen Long’s stone farmhouse in the early 1900s, he immediately transformed the building into a castle. The turret, with its angled orientation, was cut into the existing structure, rising up through the original master bedroom. Access to the upper levels of the turret at that time is unknown, possibly with an outside ladder from the flat roof of the castle. Perhaps the most memorable room in the house, the living room has seen several transformations throughout its history, reflecting the personalities of various owners. 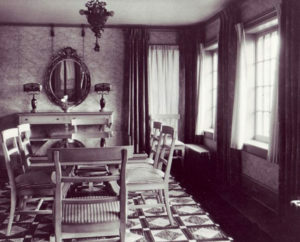 John Springer, who acquired the property in 1897 after he moved from Texas to Colorado with his wife, Eliza, and daughter, Annie Clifton, constructed this room sometime before 1910. 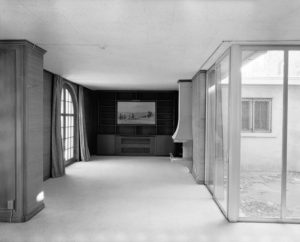 A few photographs of the room’s interior and exterior reveal that the south wall was once the back of the house and the opening into the dining room was simply a window. The former front door of Springer’s home is now a window in the center of the north wall, however, the shape and size of the room have remained unchanged from the original construction. 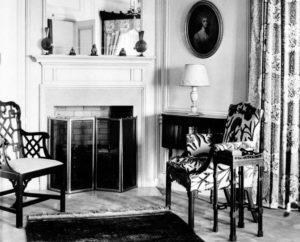 The living room saw some dramatic changes during Frank Kistler’s renovation in 1929 and 1930. The original fireplace was replaced with an ornate polished sandstone centerpiece that included the building floor plan, date of construction, and ranch brand chiseled into the mantel. The addition of large arched doorways provided elegant transitions into adjoining rooms to the south, east and west. A massive clock, imported from Italy and Germany, was added to the east wall. Sometime between 1910 and 1920, the home received a centralized heating system with a coal-fired boiler located in a separate building and small tunnels excavated beneath the living room for the pipes that fed radiators beneath the windows. Iron covers that enclosed the radiators display an interesting pattern that is repeated in other ornamental features throughout the Mansion. 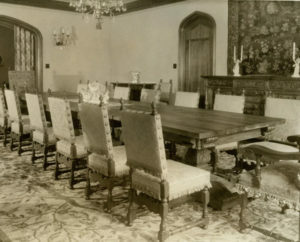 Many elaborate dinners and festive gatherings took place in the Mansion’s dining room. Most likely added by either John Springer or Colonel William Hughes, the room was expanded to the south during Frank Kistler’s 1929-1930 renovation. The elevation of the floor changes as you enter the dining room from the living room, however, it matches the rooms to the west. The floor is Brazilian cherry, the crown molding is wood, and the sconces appear to be from the 1930s. During the Metro District’s renovation of the Mansion from 2011 to 2012, two large rainwater storage cisterns were found under the south half of the floor of the dining room. Either John Springer or Colonel William Hughes probably added the library at the same time as the first phase of the dining room. 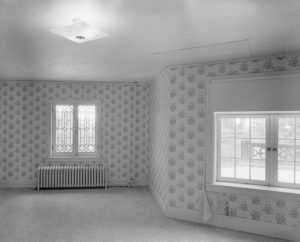 The walls were covered with an elaborate wood paneling treatment with “coupons” that hold it in place without visible metal nails. An intricately carved wooden crown molding along the ceiling added even more distinction. Constructed at a time when the building complex had a coal-fired boiler to deliver steam heat through radiators, the craftsmanship of the builders was also demonstrated by hiding the radiators behind a wood and iron screen. Before the addition of the solarium and upstairs bedrooms, the library’s west door would have opened into an outdoor garden area with a clear view to the Front Range. Throughout its history, this elegant space served as a center of entertainment, the perfect location for the Mansion’s influential owners to host parties, dances and similar gatherings for Denver’s top elites and socialites. 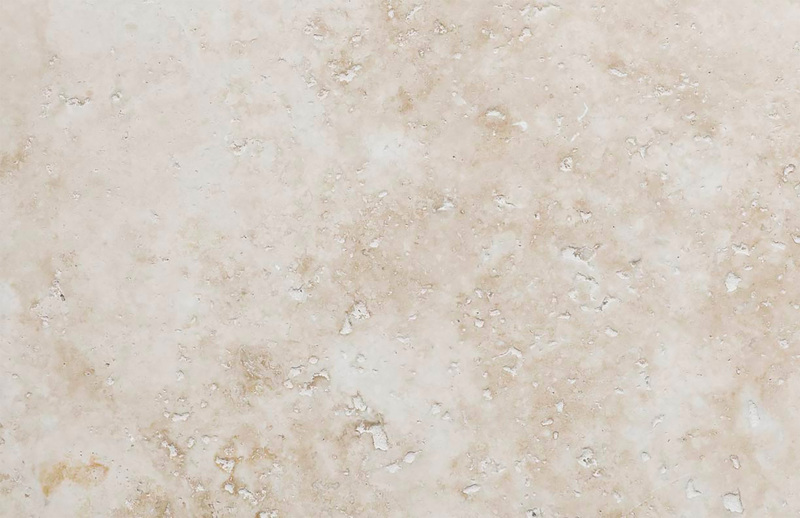 Imagine the beautiful Italian terrazzo floor with copper inlays sparkling as guests were welcomed to the hall, greeted by a warm fire crackling in the marble fireplace. Recent research has shown this wing of the house may have been built as early as the Springer/Hughes era in the early 1900s, however Frank Kistler’s 1929-1930 renovations transformed the room into the beautiful space it is today. All light fixtures on the walls and ceiling, as well as the unique art deco inspired curtain rods, are original from Kistler’s period. During this time, the room was also expanded to the south to include a wall of windows and steel supports for the second floor bedrooms were hidden in wooden coffers that give the ceiling a unique appearance. Located on the west end of the solarium, this room most likely served dual purposes. First, the inclusion of an adjacent full bathroom and closet suggests this was probably a guest room for overnight visitors to the Mansion. Other theories, however, point to the original low-hanging central ceiling light as evidence that the room once hosted late night card games, perhaps following a grand affair in the solarium next door. For either occasion, the addition of a second door to the area, no doubt provided maximum privacy and security. Constructed sometime before the 1930s, the card room doubles as the dressing suite for present day weddings at the Mansion. Although this room was referred to as the breakfast room by the Lawrence Phipps Jr. family, breakfast was not the only meal served here. In fact, most family meal gatherings took place in this small room, providing a cozier, more intimate setting than the formal dining room. Discoveries made during the Metro District’s 2011-2012 renovation, revealed that this room had been built before the nearby dining room and library. When the common wall between the butler’s pantry and this room was stripped, stonework for doorways from two different periods was discovered. These doorways indicated that the breakfast room was probably added after Samuel Allen Long’s original house was built, possibly as part of John Springer’s home, and then modified during the expansion of the dining room during Frank Kistler’s 1929-1930 renovation. Throughout its long history, the Mansion has been a place of celebration. In keeping with this tradition, the Metro District’s 2011-2012 renovation included the addition of a 5,000-square-foot great hall, built by connecting the back of the Mansion with its historic carriage house, thus creating a venue for modern day celebrations that embraces the past and also looks to the future. The great hall is not necessarily a new space as much as it is a fusion of existing structures dedicated to the purpose of bringing families, friends and neighbors together. Turn-of-the-century homes often featured a separate outbuilding known as a carriage house for storage of horse-drawn carriages and related equipment. While carriage houses in the city were usually small and practical, those belonging to large estates such as the Mansion’s, could be very elaborate and able to accommodate several carriages. It is believed this carriage house was constructed sometime in the early 1900s by John Springer, who was known throughout Colorado for his collection of fine carriages and horses. Springer’s Cross Country Horse and Cattle Ranch specialized in the breeding of German Oldenburgs, magnificent coach horses rarely found in the United States. Springer was a sight to behold, trotting around town with four of these rare horses towing his stately carriage behind them. Constructed of native stone collected from the immediate area, the carriage house features six bays, quite large even for an estate of this size. While it was originally designed for John Springer’s carriages, all subsequent owners later used it as a garage for their automobiles. Frank Kistler’s 1929-1930 renovations included the addition of heat radiators in the carriage house. Now, it is part of the great hall and adds historical charm to events at the Mansion. 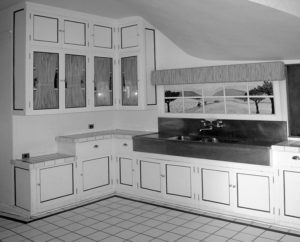 Visitors to the Mansion often mistake the butler’s pantry for the kitchen, an understandable error considering the two rooms served as functional companions. Meal preparation took place in the mint-green kitchen originally located in today’s main hallway, and the butler’s pantry existed as a utility and staging area. Here, cooked and prepared food was plated and loaded onto a cart to serve to hungry guests. Notice the sloped floor leading into the dining room. This slope was a welcome relief for servants guiding heavy carts laden with dishes, utensils and food. The butler’s pantry also features many cabinets and drawers, serving dish and utensil storage, and a large vault that housed valuable objects such as fine china, silver and linens. Other unique features in the room include two solid nickel sinks intersected by an S-curved divider, and an oddly shaped ceiling, the result of the addition of a grand staircase to the second floor. A servant’s call box originally occupied the room’s east wall. This handy device was connected to a house-wide system in which the push of a button, for instance, from an owner’s bedroom would raise a flag in the call box, signaling the servants where help was needed. The butler’s pantry originally existed as a kitchen for the first home built by Samuel Allen Long in 1891 and was probably expanded during the dining room addition sometime before the 1920s. This area of the Mansion functions much as it did during Samuel Allen Long’s day, as the hub of the home, an area where visitors are received and welcomed. A jutting wall in the history lounge identifies the eastern most portion of what was once the living room of Samuel Allen Long’s 1891 home. To get an idea of the length of the original building, imagine this wall extending approximately 50 feet to the south, down the main hallway, past the bathrooms and elevator, and ending at the entrance to the great hall. The shadow of the original home’s only staircase can be seen angling up this south wall. 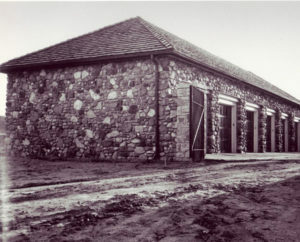 In the early 1900s, John Springer completed an addition beyond the 1891 home’s east wall, creating what was most likely an office for his ranching operation. Frank Kistler added a large tiled bathroom and enclosed courtyard off the office during his 1929-1930 renovation. The exposed stone walls of these additions can still be seen in the Mansion’s present day restrooms. The ladies restroom, in particular, showcases the green tile formerly located in the office bathroom as well as the courtyard windows. 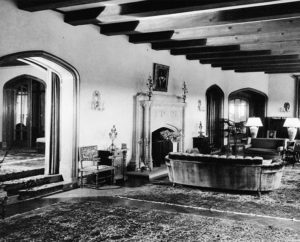 The sitting room has seen several construction phases throughout its history. During the Springer/Hughes ownership in the early 1900s, the room’s north wall served as the Mansion’s back, as indicated by the great thickness of the wall and the difference in floor elevation between the rooms it separates. When the building’s western wing was constructed, the back wall was pushed out to a point about half way into the current sitting room. At that time, the area served more as an extension of the long hallway that stretches through the upstairs western wing than an actual room. 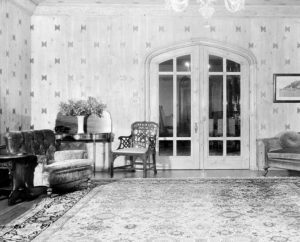 Finally, in 1929-1930, Frank Kistler extended all upstairs hallway bedrooms to the south, and completed this sitting room in the process. 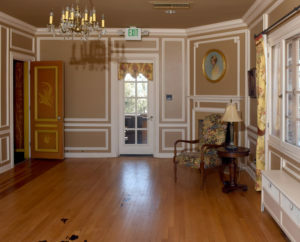 The room became a comfortable and private upstairs refuge for Mansion occupants, and was the site of filming the Centennial miniseries in the 1970s. Although it may seem odd today, many older homes belonging to affluent families featured separate bedrooms for husband and wife. 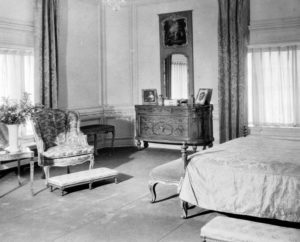 The Mansion’s private master suite included not only separate bedrooms, but also his and her bathrooms, bestowing a whole new level of luxury and comfort to its married couples. In the early 1900s, John Springer built these bedrooms directly above the grand living room, adding transom windows to both levels to create a near duplicate effect on the house’s front exterior. An alcove on the western wall of the wife’s bedroom includes a window that once offered spectacular Colorado mountain views, lost after the addition of a western wing to the Mansion in the 1920s blocked the window. During Frank Kistler’s 1929-1930 renovations both bathrooms received updates, including plumbing and fixtures considered modern for the day. Kistler also commissioned an artist to hand-paint the bathrooms walls. While the husband’s bathroom artwork consists of geometric designs and patterns in red and black, a more delicate, nature oriented approach was taken in the wife’s bathroom, where soft yellow and blue tones dominate. The wife’s bathroom also offers its user the choice of a toilet or bidet, both of which are located in separate private closet rooms with unique curved doors that give the bathroom a circular appearance. 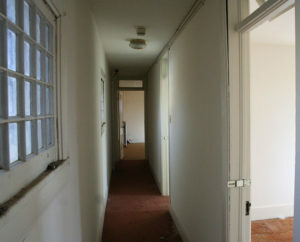 The long hallway of the Mansion’s upstairs western wing leads visitors to various bedrooms once reserved for the children of the families that lived here. There were a total of five children’s bedrooms, four with adjoining Jack and Jill bathrooms equipped with fixtures built at a shortened, child accessible height. A private bathroom adjoined the last bedroom and since it did not include an outdoor window, builders added a hallway window to gather light from the window across the hall. All hallway rooms were originally half their size, but were expanded to the south by Frank Kistler in 1929-1930. 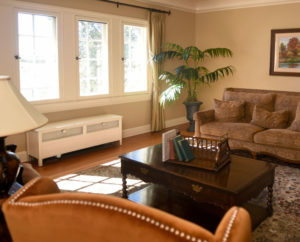 During the Metro District’s 2011-2012 renovations to the Mansion, shared walls in the last four bedrooms were removed to create large areas that could better accommodate meetings, conferences, and other events held by community groups and organizations. Visitors that commit to a trek down the Mansion’s long upstairs hallway are rewarded by this treasured room. Most likely a guest retreat, the west bedroom offers the most impressive views of any room in the Mansion, including the windmill to the south, Front Range to the west, and downtown Denver to the north. An outdoor patio nearly encircles the entire room and a corner fireplace provides warmth on cold days. The adjoining full bathroom features a five-head shower and walls hand-painted in Asian motif by an artist commissioned by Frank Kistler the early 1930s. The pretty little girl seen in the portrait above the fireplace is Joan Phipps, daughter of the Mansion’s last private owner, Lawrence Phipps, Jr. The Phipps family generously donated the painting to be permanently displayed in the Mansion. These rooms were part of the original home built by Samuel Allen Long in 1891. Long’s home included an upstairs half story devoted solely to bedroom space. 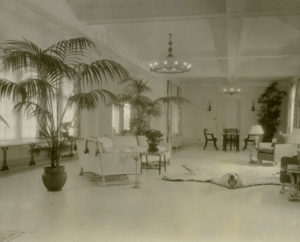 The “blue room” was probably half its current size, and may have been a short hallway, as the roof of the original building was much lower than it is today. In fact, Long’s master bedroom was actually centered below the 1891 cornerstone carving visible under the eastern wing’s second story facade window. John Springer added to the space in the early 1900s, creating two large bedrooms. An additional bedroom situated to the south is now used as a meeting room for Mansion staff. 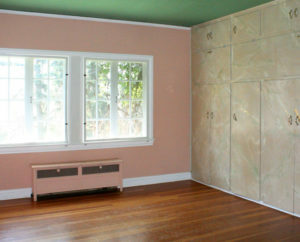 The bedroom adjoined a pink bathroom now occupied by an elevator that was added during the Metro District’s 2011-2012 renovation. Prior to the Metro District’s 2011-2012 renovations, the area of the Mansion known as the Servants’ Quarters was arguably in the most disrepair, especially the floor and ceiling. Nearly half of this space consisted of Samuel Allen Long’s 1891 half story upstairs bedrooms, making it part of the oldest section of the home. The next phase of construction took place in the early 1900s when either John Springer or Colonel William Hughes built the eastern half, adding approximately three bedrooms to be used as living quarters by the Mansion’s domestic help. A tight spiral staircase leading from the main floor servants’ dining room to the upstairs servants’ quarters was also constructed, and servants were henceforth forbidden to use the grand staircase to access floors. In 2011-2012, the servants’ quarters were renovated and converted into administrative offices for Mansion staff.